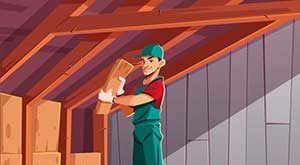 While many jobs require you to be wary about where you step, most pale in comparison to the roofing industry. It’s a high-risk job that puts you in precarious situations every day. Not only do you have to worry about the usual hazards associated with construction jobs, but your workplace environment is at least 10 feet off the ground. One misstep can cause you to fall off the roof and experience significant injury. If you happen to be working in inclement weather conditions, that risk rises exponentially. One of your best lines of defense against possible injury is quality footwear. The right pair of work boots or shoes can help you stay stable and protected from a variety of hazards. With that being said, ordinary work footwear just won’t cut it. You need to invest in footwear that’s designed to target the unique obstacles you’ll be facing. Your footwear should give you the ability to work confidently no matter what. 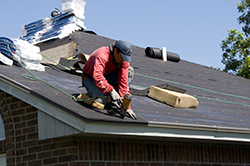 While it may seem like a tall order, here are some of the best footwear options for roofers. 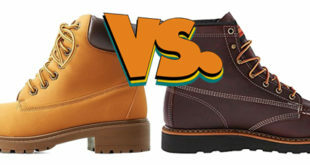 With its unique wedge sole and strong tread design, these boots from Timberland can serve you well as you work. The rubber sole is slip and oil resistant. The exterior of the boots are also resistant to abrasions. They’re made from durable full-grain leather. On the back of the boots is a leather pull. This allows you to slip the boots on comfortably at a moment’s notice. Inside is a rigid EVA midsole. It supports your arch as you work and helps to reduce fatigue once you get off. 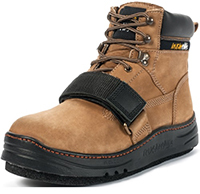 These boots from Cougar Paws are designed with roofers in mind. Their most noticeable feature is the inclusion of the Peak Line pads. These pads attach directly to the bottom of the sole to keep roofing material protected and absorb heat. They’re easy to remove when you get off the roof or when it’s time for a replacement. The boots also meet ASTM safety ratings for slip resistance. The uppers are made from flexible leather and feature a full lace closure system. To prevent loose laces from becoming a tripping hazard, a large security band is included. The inside of the boots features a cushioned lining to keep your feet comfortable throughout the day. 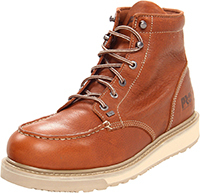 From Caterpillar is this durable leather boot. Leather is used on the uppers and extends beyond the ankle for added protection. The material can hold up well to repeated wear and the rigors of working with rough roofing material. It also has a padded collar for comfort. The lace closure system allows you to get a snug fit. Inside, the boots have a Climasphere liner, which wicks away moisture to help keep you dry as you work. The soles feature a thick rubber sole and utilize welt construction for lasting durability. 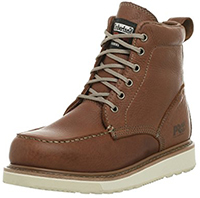 If comfort and support are your main concern, these Thorogood boots are a great option. They have a dual-density insole that works to absorb shock. It’s removable for easy cleaning. There’s also a cushioned footbed for added support. The sole is made from a synthetic material and has a composite shank built right in for rigidity. In terms of grip, the sole has subtle lugs and a rough texture for traction on any roofing material. The uppers are made from durable leather. The material is tanned with oil to provide resilience and achieve the deep black color. 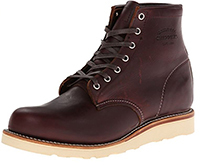 These Chippewa boots are tough enough to withstand the abuse of rough shingles. They feature a Vibram sole, which is renowned for its excellent durability and traction. The treads are shallow, making it great for roofing. The uppers are made from high-quality leather and extend 6 inches up from the arch. They utilize flat waxed laces to get a tight fit. To keep your feet comfortable, the boots have a Poron insole. It’s designed to reduce friction and prevent calluses while absorbing shock as you move. The boots are available in four different neutral colors. The Barstow wedge boots from Timberland offer superior traction and protection. The wedge shape maximizes your foot’s contact with the surface underneath. There’s also a shallow tread that incorporates horizontal line patterns to give you improved grip. Overall, the soles are slip-resistant and shock-resistant to keep you grounded. 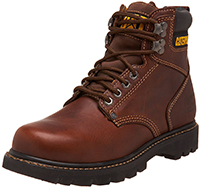 The exterior portion of the work boots are made from durable leather. Inside, the boots are very classic and minimal. Aside from some light lining along the collar and footbed, the boots are bare. This can help to decrease weight. These boots are designed to give you ultimate flexibility as you work. They have a thin crepe sole, which is made from multiple sheets of latex. Your feet will be able to flex while still receiving the support they need to stay comfortable. On the bottom, they have a Traction Tred design. It’s made up of shallow verticle waves that provide grip at all angles. The uppers are made from leather. They’re available in a range of different colors and have a traditional Oxford profile. When you’re on the search for that perfect pair of work boots, there are a few things to consider. There are numerous safety features available, so it’s good to look out for design aspects that can tackle obstacles you’ll face on a roof. 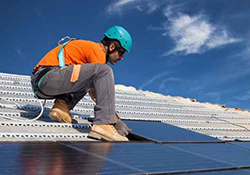 The biggest benefit to choosing the right boots is that you’re able to work to the best of your abilities while staying safe, comfortable, and firm on a variety of different roofing materials. Possibly the most important feature you can look for is the traction a pair of boots can provide you with. Falls are the biggest danger you’ll face. In fact, approximately 39% of fatalities in the construction industry are a result of falling according to OSHA. 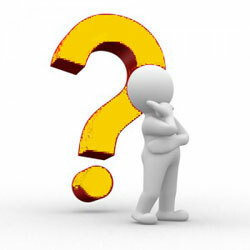 In the roofing industry alone, falls are the cause of three-fourths of fatalities. It’s in your best interest to invest in boots that have solid grip wherever you go. Pay attention to the quality of the outsole. 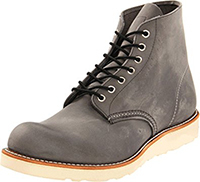 The bottom of the boots should be thick and made of a high-quality rubber or synthetic material. It’s also important to go with boots that have an aggressive tread design. Treads should be relatively thin compared to standard work boots. There shouldn’t be any deep lugs or cutouts. This unique design maximizes the contact between the roofing material and the sole. Avoid anything that’s too smooth or includes prominent lugs that can cause you to lose your balance. 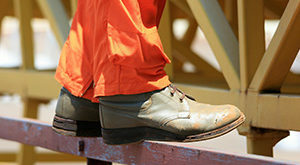 If you regularly work after a storm or in wet environments, you may also want to consider a slip-resistant sole design. These types of soles allow you to move on slick surfaces without having to worry about falling. Special grooves in on the sole help to redirect water away from key pressure points on your foot to improve grip. As you work on a roof, your boots are experiencing significant abrasive damage. Traditional asphalt shingles are very rough. They contain fine granules that feel similar to sandpaper. Over time, constant contact with the tough material will eat away at your boots. Cheaper options won’t last long. To ensure that your boots can hold up to that wear and tear, go with durable materials like leather. Leather is naturally very resilient. It’s thick and can be treated a number of different ways. Leather also provides a safe barrier between dangerous obstacles and your foot. One commonly overlooked hazard is hot tar. 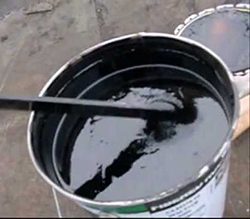 The thick and sticky nature of tar can make it a nightmare to get rid of. Because it cools so quickly, a brief moment of exposure on the skin can cause significant damage. Leather can keep you protected. It’s thick enough to briefly withstand the heat so that you can remove your boot unscathed. Overall, it’s important to invest in high-quality uppers that are built to keep you safe from all types of injuries. Around 11% of roofing-related fatalities are from electrocution. Even if you’re not dealing with electrical issues, hazards may still be present. It’s not uncommon to see live wires or transformers on a roof. Many homes also utilize an overhead line to connect to the local power grid. Depending on the weather conditions, you may also be at risk for lightning strikes. Shock-resistant work boots can help you stay safe. They utilize a thick rubber sole. 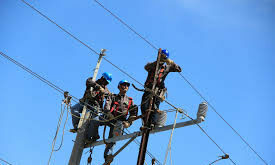 Rubber will not conduct electricity. By having it on the soles of your shoes, you can effectively reduce the flow of electricity if you get shocked. They help to keep you grounded. Pull-on boots aren’t a good idea when you’re navigating a sloped roof. Laces are the way to go because they can provide you with a snug fit every time and on various points on your foot. 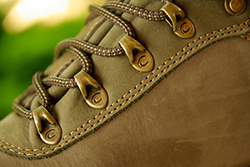 The lacing system should start on the top of your foot and extend up to the top of the tongue. Another important feature to look out for is how secure the laces are. Tripping on loose shoe laces is far too common. If that happens on a roof, the results can be grim. 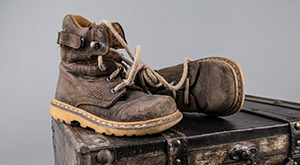 Many work boots include an additional security measure to ensure that even if your laces loosen up a bit, they won’t fall down and become a tripping hazard. These include loops and straps to cover the knot. Comfort is an important thing to consider when looking for work footwear. Work boots and shoes are worn for hours at a time and are often used when you’re performing strenuous physical activities. A lack of comfort features can result in significant pain that lasts long after you’ve taken the boots off. To ensure that you’re comfortable enough to work all day long, look for built-in features like cushioning and support. The bottoms of your feet should be protected from blisters with a soft and comfortable lining. The soles should also have a design that can help to absorb some of the force of impact and spread it to various points of your foot. This can help to avoid conditions like Plantar Fasciitis. Midsoles should also have adequate arch support. Depending on where you’re working, you may want to look into certain comfort features that pertain to the weather. For example, if you typically work under the blazing sun, ventilation and sweat control are must-haves. Boots made for hot environments have small holes or mesh fabric to promote air circulation. If you’re in a colder environment, it’s good to get insulated footwear. Insulation can help regulate your body temperature by creating a thick barrier around your foot. Invest in your safety and comfort by taking the time to find footwear that works for your needs. While it may not seem like a big deal, you’ll appreciate the security your boots offer when the worst-case scenario happens. With the right footwear, you can rest assured that all the bases are covered. You’ll be able to work confidently and focus on the job at hand.